In 2007, Las Vegas is set to see the opening of one of the grandest hotels in the area. The Palazzo Hotel Las Vegas spares no expense to be the hotel to make a splash when it opens this season. This hotel will have it all, starting with 50 floors and over three thousand lavish guest suites. In the lobby you will be greeted by a sixty foot glass dome, luxury two story fountains, bronze columns, and imported marble. 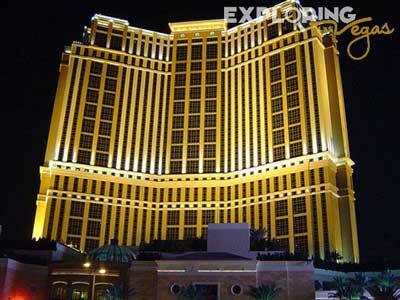 Two entrances are available, from the street and the Venetian Casino. Those heading in from the Venetian will head through a towering structure made of glass and decorative iron. You will walk along a path of polished marble as you head into the stunning beauty of the resort. As for the landscaping you will be able to enjoy palm trees, beautiful flowers and exotic natural plant life. In addition to the main guest suites, the Palazzo Casino Resort will also be home to at least 375 higher end concierge suites. The Palazzo Las Vegas will also be home to six villas that vary in size but could reach 11,000 square feet each, with up to four bedrooms, 4.5 baths, lavish living rooms, massage areas, personal gyms, private Jacuzzis, extensive media rooms, and much more. Some of the villas will even come complete with putting greens. In the resort, there will be at least 296 multi-room suites and up to six presidential suites. All villas and the presidential suites will have the luxury of private butler services. The guest suites at the Palazzo Hotel Las Vegas will be at least 655 square feet, though many will be as large as 735 square feet. Each room has a separate, raised sleeping area with the bathroom and a separate living and working area. This setup will allow guests to work and sleep or even entertain in separate areas. Common features in the average guest suites include two queen or one king beds, dual line speaker phones, dining tables, fax machines, pullout sleeper sofas, writing desks, and sitting chairs. When you are out of your room at Palazzo Las Vegas you will have a chance to enjoy at least one signature restaurant and a theater that will be hosting something unique whether it is an elaborate Las Vegas production or something from Broadway. Of course, you could also visit the Palazzo pool deck. This beautiful area will be surrounded with gardens and lovely sculptures. The pool deck will be home to numerous cabanas, fountains, and at least seven pools. A spa facility will be located adjacent to the pool area. Yes, an underground parking garage. The Shoppes at The Palazzo, SpaClub (european thermal spa cabins), fitness center, maternity services, pool deck, meeting and convention space (2.25 million square feet of meeting space), catering, business center, floral service. Suite Amenities : 720 sf., King-size bed, sofa sleeper, remote roman shades and curtains, refreshment center, two flat screen TVs, small lCD TV in bathroom, wireless internet, safe, fax, printer, copier. Table Games : BJ, dice, roulette, Pai Gow, Caribbean Stud and all other table games, european roulette with $500 flat limit. All favorite slots, club grazie membership. Lavo nightclub, Carnevino (authentic Italian cuisine), Cut by Wolfgang Puck (american steakhouse), Dal Toro (Italian style), Dos Caminos (mexican cuisine), Double Helix bar (wines around the world), Espressamente illy (Italian cafe), Grand Lux, Jade Noodle Dim Sum (uthentic asian noodle dishes ), Mainland (asian), Morels (French steakhouse and bistro), Charlie (Seafood), SushiSamba (Japanese, Brezilian, Peruvian cuisine), Table 10 (American), Woo (pan-asian), In suite Dining. When Palazzo first opened I thought it will be as impresssive as Venetian since they are sisters, the outside was OK but other than the waterfall, there is nothing to decorate inside, plane walls, a few shops and boring casino design as if they run out of money. Lots to do, lots to see. Great Gambling at the Craps tables. Love the restaurants, shopping, whole shebang. Do it!